“We call for unconditional, unimpeded and sustained access to all people in need,” said a U.N. spokesperson. An international aid convoy reached Daraya—a Syrian town under siege by government forces—in the middle of the night, delivering food supplies for the first time since 2012, a U.N. spokesman said on Friday. 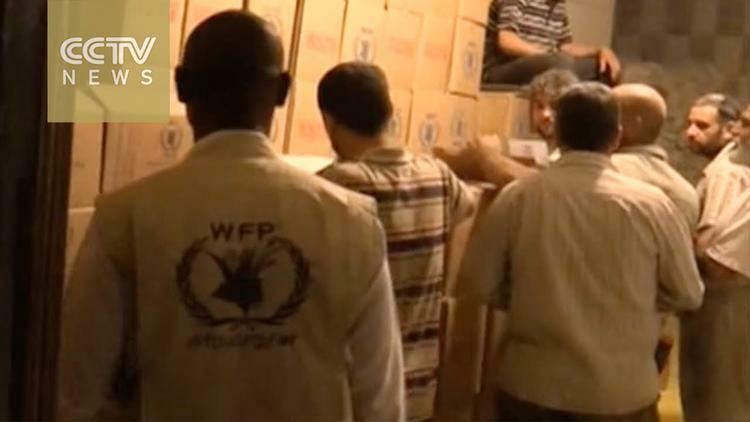 Trucks from the United Nations and Syrian Arab Red Crescent brought a month’s supply of food for 2,400 people, Jens Laerke, spokesperson for the U.N. Office for the Coordination of Humanitarian Affairs (OCHA), said. “It was quite a feat, our field colleagues tell us. We are very proud of them today that they managed to get through all the checkpoints to get in there, deliver overnight, stock what needed to be stocked and provide food for the first time in years to people inside Daraya,” Laerke told a news briefing. Malnutrition has been reported in the rebel-held town, which is only some 12 kms (7.5 miles) from Damascus, where a first convoy with non-food supplies was allowed to enter on June 1. U.N. mediator Staffan de Mistura, speaking to reporters on Thursday, said Bashar al-Assad’s government had approved U.N. land convoys to 15 of 17 government-besieged areas in June. Air drops remain an option if the convoys did not move, he said. As well as wheat flour and other foodstuffs, health and hygiene items for Daraya’s entire estimated population of 4,000 were delivered overnight and will be distributed by Red Crescent workers, Laerke said. “However of course we call for unconditional, unimpeded and sustained access to all people in need, wherever they are, but in particular besieged and hard-to-reach areas where we have still about 4.6 million people living under these conditions in Syria,” he added. Some 1.9 tonnes of medicines for chronic diseases such as hypertension and diabetes as well as antibiotics and vitamins, from the World Health Organization were on the convoy, spokesman Tarik Jasarevic said. However, the government did not approve delivery of three burns kits that would have been enough to treat about 30 people with dressings and pain killers, rejecting them from the approved list, he said.